Well, the Mark I with automotive type wiper motors (12V DC) didn't work, so something else was required. Since EBay offers a lot of material that is suitable and available at reasonable prices, I changed for 3-phase 230V 50Hz AC gearmotors, which can be controlled by frequency converters. I know, belt and pulley are doing fine, but the already mentioned 'play factor' is taking it's toll. In addition, I am still learning and want to play and try what is possible. 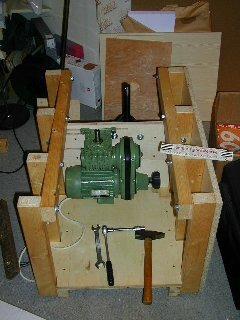 Although this machine is far from resembling a M-o-M, by Dennis Rech, he, his website and the list he runs at Yahoo gave a lot of ideas. It is fun to read the archived messages, one should do so before posting a question, a lot of information is in there. 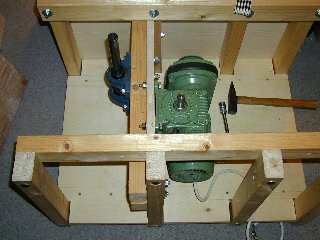 The wooden frame is the one as originally designed for the Mark I, I added a plywood board to carry the primary gearmotor. The turntable shaft (25 mm, about 1 inch) runs in two ball bearings. 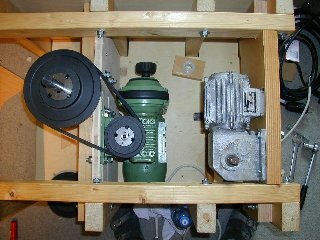 Motor output shaft and turntable will be connected by pulleys (1 : 1.6 reduction). It is planned to have another pulley installed at the topmost end of the shaft to carry the actual turntable. The green motor drives a variable belt gearbox, controlled by the black knob at the right hand side. To this a further reduction, a worm gear, is attached. Originally the drive has a variable output of 19 to 78 rpm. By installing a frequency converter this can be contolled even better (i.e. : slower, down to about 4 to 15 rpm). With the additional belt and pulleys I should come down to a nice 2.5 rpm for figuring. The black rod in the middle background is the turntable shaft. The overarm subassembly is planned to go at the right hand side, on the picture in the lower right hand corner, the eccentric drive motor to the lower left hand corner. Another view, same stage of construction. The centers of the shafts are 20 cm (8") apart and will take 100 mm (drive) and 160 mm (turntable) pulleys. To the center opening in the front frame a housing will be mounted to hold all the electric things like the FCs, switches and variable resistors (5 kOhm) to control the speed of both main drive and eccentric motor. All other openings will be covered by plywood or particle board, I just use what's laying around. Top view. To the left is the eccentric drive motor which does up to 13 rpm. Probably not enough for some tasks, but well, we'll see. The woodblock with the Nylon® bushing inserted at the bottom of the machine right between the motors is the lower eccentric shaft bearing. Almost completed. The brown dish is a flower pot thing of about 50 cm (20") diameter, it should hold the slurry. 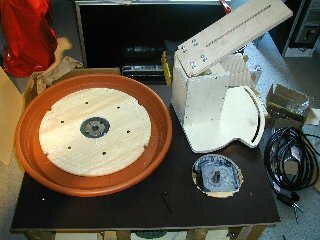 Since the main shaft is a bit too short, and therefore not allowing for too much space, I may have to attach the dish to the turntable and not to the tabletop. Loosening two bolts will allow to take the complete turntable off the shaft. (at the shiny metal thing in the middle of the TT). On top of the electronics box are the controls. To the right are two switches plus the emergency shut-off button. The switches are to turn on the FI one after another since switching both 'on' at the same time might trip the fuse. The other buttons are 'Start' and 'Stop', green and red, respectively. The knobs are 5KOhm variable resistor which control the drive speeds. 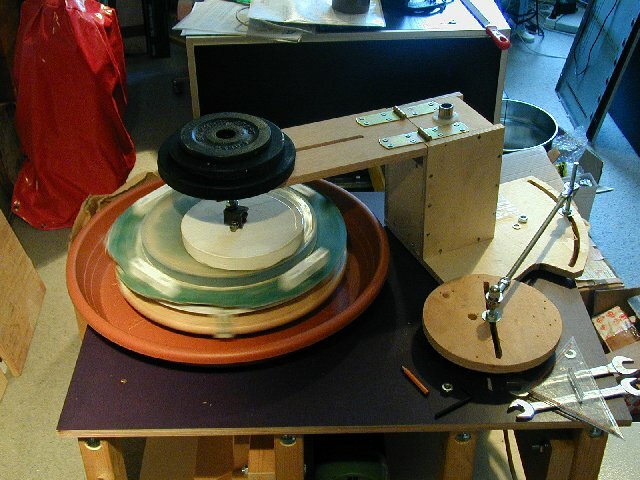 This shows a 12" (30 cm) piece of Borofloat on top of the Turntable with the overarm in working position. However, there are still some days left until it is going to accept grit. First Grit on 1 March 2004. Well there is a lot to be learned for now the minor (and major) construction faults show up like a sore thumb.